Two words that kind of send shivers down the spine of the average fan. A necessary evil in the modern game. Football is big business in the UK, and with massive stadiums to fill and even bigger wages to be paid, utilising business links – both local and worldwide – seems like a decent enough marriage. However people can feel that it can be a little bit unfriendly at times, with the common fan ushered to the side to accommodate corporate hospitality, and 100-year plus heritages of clubs sold up the swanny for a season or two, you can see why the odd fan can feel a bit disenfranchised. Take for example the title of this post. 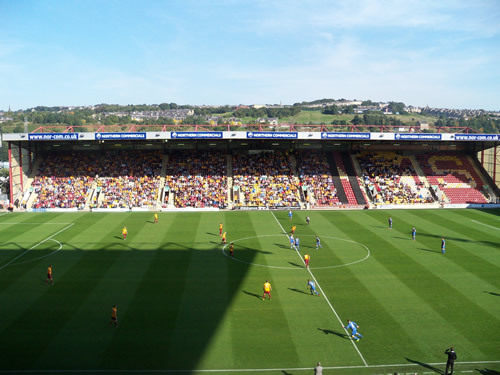 Most fans will know of Bradford City’s ground as Valley Parade, so when confirming the ground name on Wikipedia, I was surprised to see the ground took the name of the ground to bear the name of a local double glazer. I don’t begrudge Bradford City, heck even my beloved football club of Colwyn Bay bore the stadium name of a butcher who paid a tidy sum to rename the ground for a couple of years. It didn’t matter to me per-se, as it was still Llanelian Road to me, but you can see why occasionally it grates with some people. So it was fascinating that a few months ago, one of my Bradford City mates rang up two of my Shrewsbury Town mates and asked if they wanted for the game at Valley Parade (sorry Coral!) in League 1 to “go corporate”. Be wined, dined and watch the game in the comfort of the half way line, near the directors and press. As a token groundhopper amongst my mates, I was also invited. £60 later I was on my way to Bradford. I also had the luxury of a lift for the game, so arrived in Bradford after a comfortable drive at around 11:30. After arriving and a quick wander around the stadium (pausing for a few moments at the memorial to commemorate the tragic Bradford City Stadium Fire) we entred the Chaiman’s Suite for the corporate hospitality. We were greeted by a chap who was managing the hospitality in our room (there are a number of rooms offering corporate hospitality at the club), who lead us out onto the stand so we can look over the pitch and see everything. Our seats were incredible, two rows back from the front, of the upper tier, right on the half way line. After a few photos and soaking in the empty stadium (this was still a few hours before kick off), we returned to the suite to be fed and watered. The suite was quite nice actually, we took the table nearest the only TV screen showing the Nottingham Forest vs Derby County, and we were sharing our table with another party. 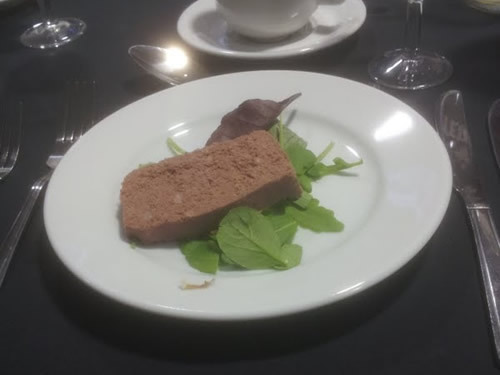 After a few beers, a read of the complimentary programme, and chatting amongst ourselves and our table guests, our first course arrived – Chicken Liver Pate. I must admit it isn’t my favourite, but I ate it. A couple of my party weren’t exactly huge fans and so asked for the soup option. I probably should’ve asked for that as well, but the poor hospitality manager looked like his permanent smile was waning. 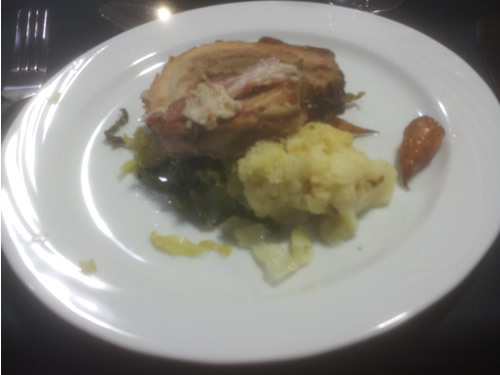 No such complaints for the main course however, which was slow roasted pork on a bed of vegetables that I only recognised carrots, it was delicious. 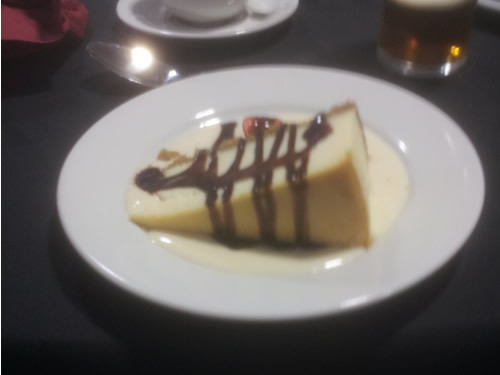 The final course was a vanilla cheesecake. This was the best of the bunch actually, a really nice cheesecake, sweet yet not overpowering, and swimming in a delicious cream sauce. I could’ve eaten three of them, if I’m honest. Following the food (which was pretty good), we were introduced to the mascots for todays game as well as one of the Bradford City players – ex Wigan Athletic player Caleb Folan. A few presentations were made and we headed out for the match. The stadium, that was empty just 2 hours before, was now awash with the roar of certainly one of the bigger sides in League 1. 14,000 fans – more than the visitors Shrewsbury Town ground can hold – packed into the stadium to watch this encounter, so they were a bit subdued where – less than a minute after kickoff, the visitors took the lead. Tom Bradshaw heading in from point blank range to take the lead. 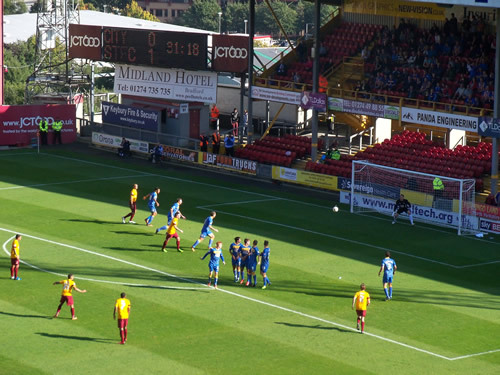 The fans became even more subdued losing Nahki Wells to a long injury which saw 4 minutes off added time at the end of the first half. City returned after the break brightly and equalised when a cross was guided in by Kyel Reid from within 8 yards. After that, the Bantams searched for a winner, and despite nearly conceding a few times, they were given a slice of luck when on 88 minutes when Dave Winfield after a second bookable offence, in a moment that was cheered by me 30 seconds after it happened (in truth, I was cheering for the Rob Hopley goal that eventually saw us through to the Third Qualifying Round of the FA Cup). The other 14,000+ people in the stadium had something to cheer with the last kick of the game, when James Hanson scored in off the post in the last few seconds. To my Shrewsbury Town mates, dejection. To my City mate, revenge from a similar game a few years earlier. After a few drinks we headed next door to the brand new 2012 Suite. 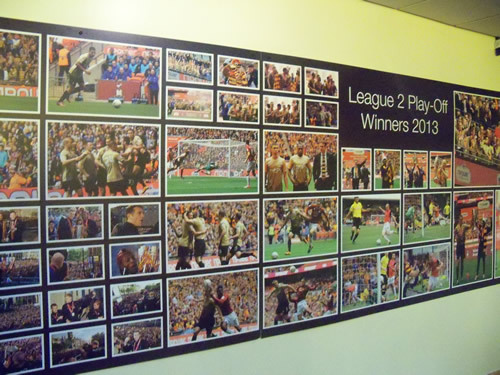 Decked in Claret & Amber, this told the tale of Bradford City’s remarkable 2013 season, which saw them go all the way to Wembley in the League Cup, and win promotion from League 2. A fantastic achievement by the club considering they knocked out three Premier League Teams on the way. Also the beers were cheaper in there – horray! I took some photos which are below. All in all, I had quite an enjoyable day as member of the Prawn Sandwich Brigade. It certainly was an experience, the food was nice, and the seats were comfy. But most importantly, the game was cracking for the neutral. There is already talk of doing the same the reverse fixture at The New Meadow. Or as it’s known in the bloody corporate world – The Greenhaus Meadow.